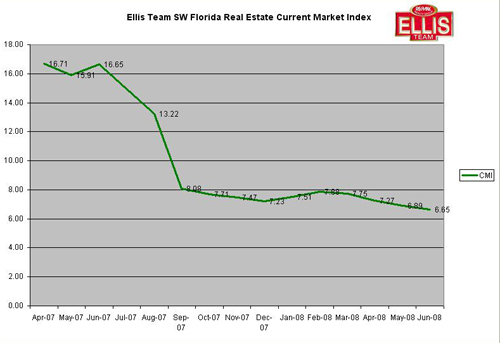 The December 2008 Ellis Team SW Florida Real Estate Current Market Index again showed improvement from last month’s index. The Current Market Index now stands at 6.65, down from 6.89 in November. The lower the number the better the market is for sellers. Transactions in the Fort Myers and Cape Coral real estate markets were up again significantly over last year as our index predicted it would be. Single family home sales in Fort Myers and Cape Coral were up 78% over last year’s numbers in October. Single family inventory is down 12.42% from last year’s numbers. In December 2007 we had over 16,000 single family homes for sale in Lee County and now that number is down to slightly over 14,000. With sales up around 80% over last year’s numbers and inventory declining, many would say that 2008 has been a year of recovery for the SW Florida real estate market, but we cannot do so until prices stabilize. Median prices have continued to head lower all year and this is why Fort Myers and Cape Coral has bucked the state and national trends, because value and affordability are back in the market. In fact, prices are so far below replacement costs that first time home buyers and investors alike are scooping these properties up as fast as they come on the market. While more foreclosures are scheduled to hit the market in 2009, many are condominiums and vacant land. We are doing a study right now along with the SW Florida Real Estate Investment Association to determine how many Lis Pen dens filings are actual home foreclosures. Keep in mind, a property may have multiple Lis Pen dens filings which may skew the numbers, so we may not see as many foreclosures in 2009 as some are quoting. Local mortgage companies are reporting fixed rates in the 4.5% range today with 1 point. Loan amounts are also on the rise, which could signal an up tick in future home buying in higher price ranges. We don’t look for drastic upward changes to median home prices, however we do like to look at mortgage applications to get a reading on potential future purchasing activity. We see regular negative articles and news stories about the real estate market, but the numbers tell another side of the story. Sellers do not like today’s prices, and nobody knows where tomorrow’s prices will be for sure, however we can report there is a market at the right price and this market has been posting large gains all year. We think many buyers and investors have figured out there are tremendous buying opportunities available now and they’re not listening to the Downers in the market. If you really want to know how a market is doing, follow the money. Buyers are back in this market because the prices are Right. It’s a lot like the BCS polls. Don’t follow what the polls say; follow the Vegas odds, because that’s where the money is. It’s amazing how much better the money does in picking games than the experts do. The numbers always tell a story. The real wisdom is deciding not which expert to listen to, but which numbers you should follow. In the SW Florida real estate market you can look at falling median prices, or increased sales. Both tell a story, and we’ll leave it to the market to decide what the numbers mean. We just thought we’d present another side you may not be seeing in the media or hearing from other experts and let you decide. The Fort Myers and Cape Coral real estate markets again posted significant gains over last years numbers, bucking national trends and leading the state of Florida for the entire year. Single family home sales in Cape Coral and Fort Myers were up 78% in October. Statewide home sales were 15% and median prices were down 24%. Median prices in Fort Myers and Cape Coral were down 42%, and this is the reason buyers are back in the SW Florida real estate market. I speak with top agents from all over the country and many times they tell me sales are way down, but prices have held steady. The reality is buyers no longer want or are able to afford the prices, so while sellers may not be selling for less, buyers aren’t buying, and that’s why their sales are way down. It’s true in just about every market where sales decline. Fort Myers and Cape Coral has led the state in reacting, perhaps because we had to with such a large inventory of brand new homes that were on the market, and this is the major reason Fort Myers and Cape Coral is leading the state back out of this. Our prices are compelling, not just attractive. In the first half of 2008 we noticed a lot of first time home buyers entering the market, which was a good sign going forward because it signaled affordability was back in the market, and buyers again had confidence going forward that 2008 was a good time to buy. In the second half of 2008 we noticed a tremendous influx of long-term investors coming back into the market. This is another good sign as investors have realized this market is priced so far below replacement cost that when this whole thing settles down they’ll be buying at tremendous savings. Fort Myers and Cape Coral truly is having a 1/2 off sale and it won’t last forever. Investors know that you make money on the Buy, not the Sell. Interest rates look like they’re falling again, and season is just about here, so 2009 could get a little interesting. Foreclosures have paused temporarily as lenders have suspended many filings. Inventory has not increased all year in the MLS even with all the foreclosures we’ve had. This is a very good sign as the market is absorbing all new inventory, because it is priced to sell. The banks losses have become new homeowners and investors gains. Not surprisingly Cape Coral and Fort Myers leads the states in condo sales gains as well. Condo sales in Fort Myers and Cape Coral were up 48% while the median price was down 5%. Statewide condo sales were only up 5% and prices were down 23% from last year. Areas like Tallahassee were down 95%, Lakeland Winter Haven 64%, Ocala 75%, and Sarasota-Bradenton 47%. As you can see, Fort Myers real estate and Cape Coral real estate is doing very well and leading the state.